1. my new thrifted granny stripe scarf. I know, I could have made one myself, and I might, but I just love the colours! soft purples and mauves, earthy greens with a chunky white border, makes me feel all bright and colourful and ready for Autumn. and these really are my colours..... very Heathery don't you think?!..... and soft and snuggly too. 2. Geninne's new art book, 'making an impression'. Gennine's artwork is amazing, she is a very talented lady. You can have a look at her art blog over here. I love her use of nature in her work and her colours. This book shows how she designs and creates her stamps and artwork. I've always fancied trying a bit of stamping! 3. Another new book. This time 'Simplicity parenting' by Kim John Payne. 4. and lastly, I'm really enjoying this fab, brown and white retro plate with my breakfast this morning. This plate used to belong to my Mum, and has been around as long as I can remember. Toast with Apricot jam, my favourite. Rhapsodie de fruit by St.Dalfour. No added sugar just sweetened with fruit juice. This is the best! Also without butter, I know, but I have got used to this and don't worry other treats take it's place! Also I must tell you, I won my first give-away!! Deborah from happilicious kindly sent me a lovely crochet hook holder which she made herself. My crochet hooks have never had a proper place to live before, so I'm really chuffed, thank you. Isn't it sweet.....Very handy......and if you pop over Deborah has mentioned a link on her post about how to make your own printed labels, as you can see she has above. Lastly I wanted to mention a lady who has inspired me a lot in the last few weeks. It's Tamar at nest pretty things. Most of you will probably have seen her etsy shop and blog. I've always been inspired by creative women in business. Tamar very successfully makes pretty jewellery. Her etsy shop has had around 10,000 sales! She is a very sweet lady who lives in beautiful Vermont with her husband and has three teenage sons. She is very productive and has a work space in the corner of her dining room. I have enjoyed reading about her home, family and work, and how things came about. Yes, I have read her whole blog, all 5 years of it I think! Do you ever do that? It's the story you see, I love story and transformation. At the beginning her products were very different to what they are now, I love seeing how things change and evolve. I recently found an interview with Tamar. Speaking about her work and her etsy shop. You can watch that here. It is long about 45 minutes so make sure to have a cup of tea at the ready. Love the plate - so retro! Must visit a few of those blogs - sound interesting. Yum apricot jam in an odd way reminds me of my first holidays abroad when I first tasted peach jam, sheltered youth you see! Hi Heather, Lots to read up here. I am just starting my first cuppa so I will enjoy checking your links. The hook case is deightful. I love the plate, how nice that it belonged to your mum and you are using it now. Jam and toast makes me happy! Nice idea, the 4 things. 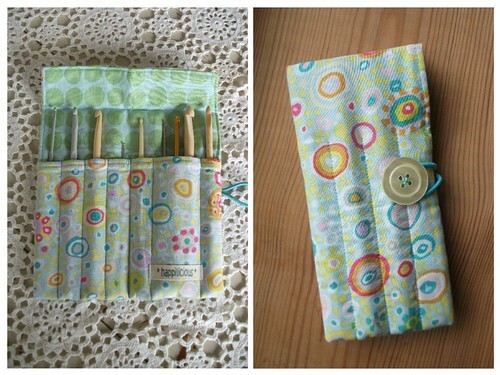 Makes me want to go cook myself a piece of toast though : -) What a cute crochet hook case. 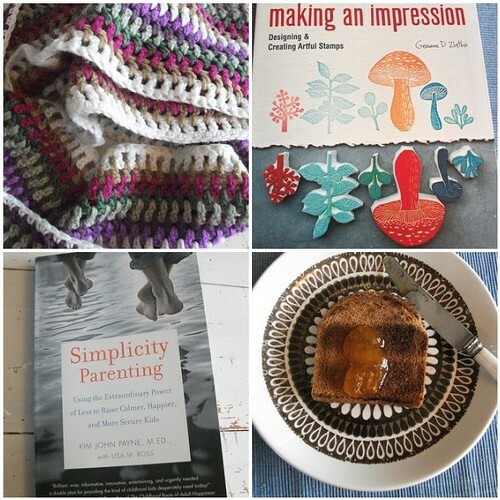 I love your 4 happy things, that book by Gennine looks gorge ... and congrats on your win, I'm rather envious looking at my pile of crochet hooks in a jumbled heap in front of me! want to make one of those for myself. perfect idea to keep the needles safe!